Looking for a sporty vehicle with all the necessary creature comforts, low maintenance and safety features? 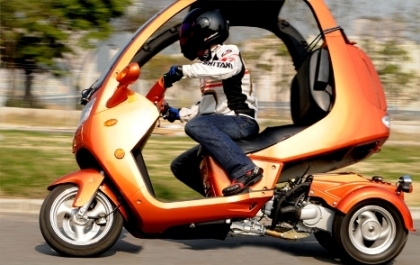 The scooter rider knows the convenience and economical value of having a vehicle that can weave in and out of traffic, avoid the jam, squeeze into narrow openings and require low maintenance. However, exposure to the elements and vulnerability in road accidents have prevented some from riding a scooter / motorcycle. The Auto Moto Corporation has come up with a state-of-the-art vehicle that will seduce you not only with its practical features but also its beauty and elegance. The Auto Moto is designed to fit two with a spacious back seat, a comfortable padded backrest and adjustable arm rests. Besides a full roof and windshield, users can opt to install a 40-gauge sea-flex UV treated scratch resistant vinyl to fully protect them from the elements. Despite its size, there is ample storage space in its extra large rear lockable trunk besides two lockable glove compartments for smaller items. The interior is comfortable and designed to cater to the Y-generation. Both driver and passenger can lean back and enjoy the stereo system or AM/FM radio player. In keeping with the MPW era, users can also hook up to connect their MP3 player or media device and enjoy the music. A built-in cell phone recognition system will indicate to users that the cell phone in the dashboard storage compartment is ringing via a flashing light on the instrument cluster. An integrated alarm system provides security from theft or burglary. Three wheels, as opposed to two in other scooters and motorcycles, offer added stability and safety. The Auto Moto is equipped with a rocking mechanism to ensure the rear wheels stay grounded when turning. Besides, the Anti Lock Braking System (ABS) prevents skidding and the risk of overturning under heavy braking. The rear differential distributes power simultaneously to both rear wheels to improve traction and prevent skidding even in bad weather. The front dual piston caliper and drilled rotors provide extensive braking abilities through the cooling and ventilation provided. 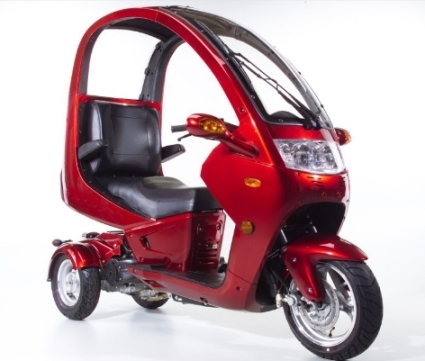 At $3800, the Auto Moto comes with a one year standard Limited Power Train Warranty. Running on the Honda designed GY6 engine and CVT transmission, the Auto Moto is guaranteed to give years of smooth riding and require very low maintenance. The Auto Moto can achieve 83 MPG, i.e. it can travel approximately 160 miles on a full 2.1 gallon tank. The low fuel maintenance, consumption, and insurance costs make this motor vehicle an urban prize.